Take a look at many cellular boosters.You’ll see that one end has a standard F connector. The other end has a slightly smaller, thinner connector. That smaller connector is an SMA connector. It’s used where you need similar performance to the regular F connector in a different package. Remember, this stuff comes from engineers. 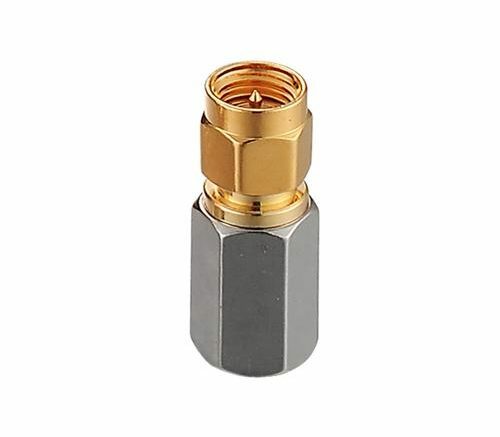 The full name of the SMA is “Radio Frequency connector, Subminiature, type A.” It was developed to have the same qualities as the F connector that’s used for most coaxial cables. However, the goal was to have a little smaller connector. A smaller connector is easier to fit into tight spaces and it works better on smaller parts. In this case though, the SMA isn’t much smaller than an F connector. It’s hard to know why those engineers really felt the world needed a slightly smaller screw-on connector, but they did. Is an SMA connector better? Because the SMA connector has the same performance as an F connector, it can be used for the same kinds of signals. Because it’s smaller, it won’t attach to regular RG6 cable, so it can really only be used for short runs of thinner cable. This makes it perfect for things like inside antennas for cell boosters. Unlike a regular F connector, it is used mostly for 50-ohm cable. (F connectors are generally associated with 75-ohm cables.) In general you should always use the correct impedance cable, because you’ll experience more signal loss if you don’t. However, you’ll sometimes see adapters like this one which convert let you use an SMA connection on a regular cable with F connectors. Depending on the run you may not be worried about the overall loss. Even so it’s still better to use the right connector for the right purpose. Also, while SMA connectors are “usually” associated with 50-ohm cables, you should always look at the specs from the manufacturer before changing cables around. SMA connectors are used when regular F connectors are too large, or for thinner cables. In the case of cellular signal boosters they are used to help the home user know which cable to connect to which side. So it really boils down to the SMA connector being there to help you figure out how to hook things up quickly, and anything that makes life easier for you can’t be bad. weBoost uses the SMA connector to make it easy for you to know which side the indoor antenna connects to. zBoost, the older brand from weBoost’s parent, used the TNC connector for the same purpose; it doesn’t make much of a difference at the frequencies that are used for cell boosting. Other manufacturers use FME connectors for the same purpose. FME connectors are even smaller than SMA ones and have even better protection against dust. In many cases they are used to snake through walls, where a very low profile connector is definitely appreciated. No matter what project you’re starting, you’ll find the best selection of cables and connectors by shopping at Solid Signal. If you don’t see what you’re looking for, call our tech staff at 877.312.4547. If we don’t carry it, we’ll contact our distributors to see if we can get it for you. We can also quote on custom-made cables if you would rather have everything you need when you start the job.